RadProgressArea can be used to monitor the progress of any measurable process. Register RadUploadHttpModule and RadUploadProgressHandler in web.config. Put a RadProgressManager control on the Web page. Put a RadProgressArea control on the Web page. Set its ProgressIndicators property to include only those controls you want to use. In the Page_Load event handler, set the Localization property of the RadProgressArea object to change the labels so that they reflect your custom process. In the code-behind, when the custom process executes, use the RadProgressContext.Current property to access the progress context. At each measurable step of the process, updates the fields of the progress context to indicate the values that RadProgressArea should display. PrimaryTotal The maximum value of the primary progress indicators. By default, RadProgressArea d isplays the request size. PrimaryValue The current value of the primary progress indicators. By default, RadProgressArea displays the uploaded bytes count. PrimaryPercent The current value of the primary progress, expressed as a percentage of PrimaryTotal. SecondaryTotal The maximum value of the secondary progress indicators. By default, RadProgressArea displays the total number of files. SecondaryValue The current value of the secondary progress indicators. 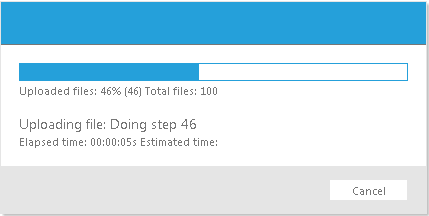 By default, RadProgressArea displays the number of files already uploaded. SecondaryPercent The current value of the secondary progress, expressed as a percentage of SecondaryTotal. CurrentOperationText The description of the current operation. By default, RadProgressArea displays the name of the currently uploading file. TimeEstimated The estimated time until the operation completes. TimeElapsed The time that has elapsed from the beginning of the operation. Speed The speed of the process. By default, RadProgressArea displays the upload speed. If you set some of these properties before upload begins, they are not used for file upload monitoring. RadProgressArea1.Localization.UploadedFiles = "Completed Steps: "
For a live example that shows how to use custom progress monitoring in combination with a file upload, see Monitoring Custom Progress.